At the age of 75, as I look back on half a century of involvement with Chinese literature, I am bemused. There was little hint in my early life that I would turn into a Chinese scholar. New England born and bred, I hardly seemed fated to wander. In fact, with a BA in physics and a job at a Long Island laboratory, I seemed set for a scientific career. But in my suitcase was a book from an English lit. course – Ezra Pound’s translation of Confucian classics, with facing Chinese character text. In my spare time, with a dictionary, I began to work my way back and forth: Chinese to English to Chinese… it was wisdom and fun; physics was abandoned. For three years I studied both modern and classical Chinese, loving the language and culture, dreaming of seeing China. When a chance came to study in Taiwan, I leapt at it. My Hunanese landlady, Mrs. Ye became my guide to Chinese culture; best of all she pointed me to Chinese storytelling and Zhang Cuifeng. Four years later I returned to the States; the transition to graduate student bookwork was painful but instructive. The library was full of mainland publications which described and analyzed a bewildering variety of genres I had never heard of. When would I see them for myself? I began teaching Chinese literature at the University of Toronto in 1966, and whenever possible drew Chinese performing arts material into the curricula, to the students’ enjoyment. In 1973 I saw China for the first time, and in the 80’s made several research trips to hear, study with, and record some of China’s superb singer-tellers. All were patient and generous to a fault with this inquisitive foreigner. I studied with my wonderful Peking Drumsinging teacher, Sun Shujun. Then at the peak of her powers, now, at age 80, she still mesmerizes audiences with her art. Gao Yuanjun and Gao Fengshan, leaders in their arts, taught me clappering too. I wanted to share this material with students, many of whom spoke no Chinese; a method evolved where, with Chinese tellers in my mind’s eye, I told the story in English first, and then we listened to the recordings. It worked, and it led to my English tellings in the wider community. After retirement in 1986, storytelling became my main focus. Now I live in Victoria, my traveling days over, grateful for the students and the performers in China and Taiwan who helped me along this path, and happy to chat with any storyteller who happens by. Recording was carried out in Kate’s home to ensure her comfort and ease at a time when she was not in good health. This necessitated some compromises in terms of sound quality. The life of the stories remains vivid, however. Although no longer performing in public, Kate offered her passion for the material to the process meaning there were no compromises when it came to enjoying it. Kate's CD is currently sold out, however you can purchase a downloadable version on CD Baby. 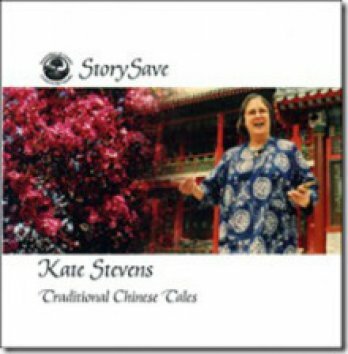 “How Li Ji Killed The Snake.” The clappertale version is by Kate Stevens herself. Her story is based on the original tale by Gan Bao (?- 336 CE) as recorded in his book In Search of Spirits (Sou Shen Ji). “The Frog Wife” (“Qing Wa Shen”). One of the tales that Pu Songling (1640-1715) incorporated in hisStrange Tales From Make-do Studio (Liao Zhai Zhi Yi). Riddles. Kate collected these from a variety of Chinese riddle books. She notes that, alas, she does not have the original sources to hand. “On The Fifth Day Of The Fifth Month We Hang Up Mugwort” (“Wu Yue Chu Wu Gua Ai Hao”). This particular version is from Interesting Stories Of Popular Customs (Min Su Qu Hua). Kate has no further information about this book. “Peng Zu And His Wife” (“Peng Zu de Gu Shi — 2″). This story appears in The Dragon King’s Daughter(Long Wang de Nü Er) by [Zhang] Qingshui (1929). “The New Year’s Picture” (“He Xin Nian Chi Jiao Zi”). This tale is from Anthology of Stories of Chinese Folk Arts (Zhong Guo Min Jian Gong Yi Gu Shi Xuan) 1983. “Where I Live.” Kate created this story in answer to the question: “Where do you live?” The material included owes a great deal to articles by Grant Keddie, archaeologist of the Royal British Columbia Museum. The articles appeared in a community newspaper. The setting is Harling Point, Victoria, B.C. Kate hopes that tellers will respect the cultural integrity of the story while making the tale their own. She discourages attempts to memorize. Kate’s Permission For Use refers to tellings of the stories only. For further information regarding rights, permissions and reproduction in other forms see Copyright.